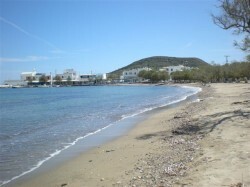 Pollonia has a beautiful, clean sandy beach in a bay protected by the harbour. 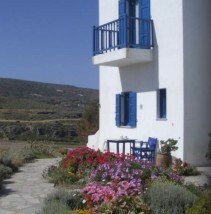 Guests with children especially enjoy its close proximity and convenience. Due to its position, the water is practically always flat calm. 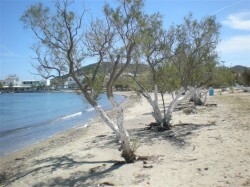 Plus, the tamarisk trees along its length offer cooling shade. All in all, excellent for children! 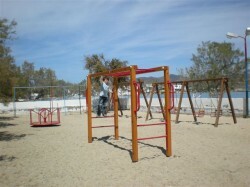 There is a large and well-looked after playground right on the beach. 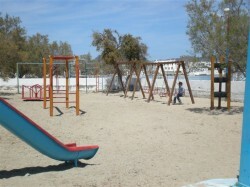 In fact, despite Milos' small population there are surprisingly many well equipped playgrounds. But the large "paidiki chara" in Pollonia does wonders to keep children amused.